Britannia pub regular Malcolm Forbes was making his way home at around 9.30pm when he was attacked in the alley by the Fort Road boozer. He was ambushed from behind and had his phone and bank cards stolen. It is believed someone tried to use the cards in Cliftonville today. The assault left Malcolm with a severe black eye. Britannia pub boss Paul Rollins reported the attack. He said: “We were informed this morning that he had been in hospital last night. 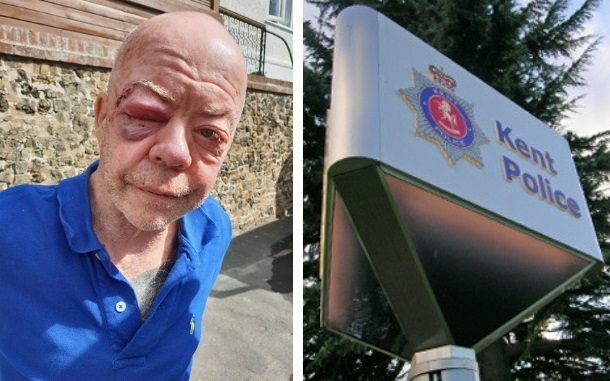 He was walking home when he was attacked from behind. He’s back at home now but being sick .so we will maybe need to get him back to hospital. Kent Police say enquiries are being carried out. A spokesman said: “Kent Police has received a third party report that a man in his 60s was robbed at a location in Margate on the evening of Saturday 15 September 2018. “The man received treatment in hospital for injuries to his face but has since been discharged. It sounds like some creep or creeps from the pub followed the poor chap. Check CCTV to see if anyone followed him from the pub. These people have no fear of the Police anymore as the Police station is just next door to that bar. There are some nasty looking people about at night in Cliftonville though and I find it unsafe to go out on my own. I wouldn’t go down an alley like that in the dark, that is for sure. Maybe it should have gates put up at both ends to stop muggers or worse lurking about waiting for victims to come along. It’s not the first time something like this has happened there. It is a great shame on our society that you can no longer go out and have a drink on your own in the evening. What roads in Ramsgate aren’t safe. I walk about the town at night and have never felt unsafe. This is right by the police station as well … Not good. What is happening to the world?? ?